Henry Goulburn PC FRS (19 March 1784 – 12 January 1856) was an English Conservative statesman and a member of the Peelite faction after 1846. Born in London, Goulburn was the eldest son of Munbee Goulburn, of London, by his wife Susannah, eldest daughter of William Chetwynd, 4th Viscount Chetwynd. He was educated at Trinity College, Cambridge. In 1808, Goulburn became Member of Parliament for Horsham. In 1810, he was appointed Under-Secretary of State for Home Affairs, and two and a half years later, he was made Under-Secretary of State for War and the Colonies. It was in this capacity that James Meehan named Goulburn, New South Wales after him, a naming that was ratified by Governor Lachlan Macquarie. 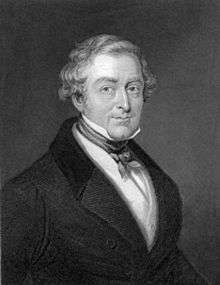 Still retaining office in the Tory government, he became a Privy Counsellor in 1821, and shortly afterwards was appointed Chief Secretary for Ireland, a position which he held until April 1827. 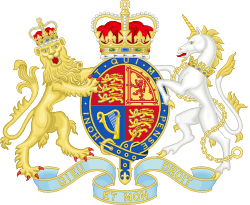 Here, although he was frequently denounced as he was considered an Orangeman, he had a successful period of office on the whole, and in 1823 he managed to pass the Composition for Tithes (Ireland) Act 1823. In January 1828, he was made Chancellor of the Exchequer under the Duke of Wellington; like his leader, he disliked Roman Catholic emancipation, which he voted against in 1828. In the domain of finance, Goulburn's chief achievements were to reduce the rate of interest on part of the national debt, and to allow anyone to sell beer upon payment of a small annual fee, a complete change of policy with regard to the drink traffic. Leaving office with Wellington in November 1830, Goulburn was Home Secretary under Sir Robert Peel for four months in 1835, and when this statesman returned to office in September 1841 he became Chancellor of the Exchequer for the second time. Although Peel himself did some of the chancellor's work, Goulburn was responsible for a further reduction in the rate of interest on the national debt, and he aided his chief in the struggle which ended in the repeal of the Corn Laws. With his colleagues, he left office in June 1846. After representing Horsham in the House of Commons for over four years, Goulburn was successively member for St Germans, for West Looe, and for the city of Armagh. In May 1831, he was elected for Cambridge University, and he retained this seat until his death. Goulburn was a member of the Canterbury Association from 27 March 1848. Goulburn married the Hon. Jane, third daughter of Matthew Montagu, 4th Baron Rokeby, in 1811. They had four children. He died on 12 January 1856, aged 71. His wife died the following year. ↑ "Goulburn, Henry (GLBN801H)". A Cambridge Alumni Database. University of Cambridge. ↑ Blain, Rev. Michael (2007). The Canterbury Association (1848–1852): A Study of Its Members' Connections (PDF). Christchurch: Project Canterbury. pp. 36–37. Retrieved 20 March 2013.